Last Saturday, I went to Armin van Buuren's show that celebrated the launch of his new album Mirage. It turned out that some of my friends were also going, instead of just me and a date, so it was even cooler to be there with Martin and Femke *and* Liedewij. It was Lied's first party after 5 years or so, and she was in for a treat. Was just pointed to a cool 4D promo for Ralph Lauren on their building in NY. But it reminded me of a celebration for Histor paints on the building of the Lloyd hotel in Amsterdam, which in turn reminded of a snow flake projection on the Amstel hotel in Amsterdam. It seems this is a cool new trend now. "Urban projections" of video mapping or skinning. There actually at least 3 Dutch companies involved: ACS AV and Climat Control AV, as well Livetime. 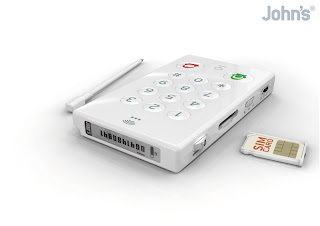 Just stared amazed at the world's latest gadget: John's Phone. It's The World's Simplest Cell Phone. Really. Full stop. It makes calls. It's a mobile phone. No SMS, no WiFi, no mp3, no camera, no address book, no display! Check the photo gallery.